Lady Cecily Clifton's Gifts of Church, Organ and Windows. St.Annes Parish Church in 1885. 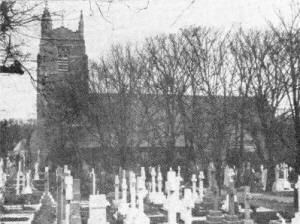 St.Annes Parish Church in 1929. The Parish Church of St. Anne was erected two years before the foundation of St. Annes-on-the-Sea. The site of St. Annes (Lytham Common and Heyhouses) was then within the ecclesiastical parish of Lytham. The population, east of the railway, was very scattered but sufficient in number, in the opinion of Lady Eleanor Cecily Clifton, great grandmother of the new Squire, to deserve a place of worship. 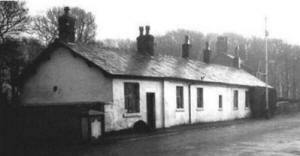 The only meeting room was the old Heyhouses Schoolhouse, now converted into cottages, of which we give a photograph. The Vicar of St. Cuthbert's Parish Church, Lytham, the Rev. Richard Barton Robinson, was the founder of Sunday afternoon services and a Sunday school, in the old Charity Schoolhouse, prior to 1870. The Rev. H. B. Hawkins succeeded to the vicariate in 1870, and the Heyhouses services were continued, the various masters and mistresses being responsible for playing the harmonium and conducting the choir. Such was the condition of things up to 1872, when there was talk of developing a new town. The now road through the sandhills (Clifton Drive), from Lytham to Squire's Gate, was in course of formation. Lady Eleanor Cecily Clifton, the wife of the Squire, a devoted Churchwoman, decided to build, at her own expense, a church for the benefit of the people of Heyhouses and the West End.
" Why do they call the place St.Annes-on-the-Sea ?
" I believe this name was something like Topsy -- it growed." I don't think it ever was born and properly christened, but it arose something in this way: The good wife of the Squire, Lady Cicely Clifton, having always the wants of the people round about her at heart, saw that the people of Hey-houses needed better accommodation for public worship, and took it into her generous head to build and endow a church for their use, at the same time having regard to the :requirements of the proposed town (then only existing, like many an American city, on paper).
" The designs for this church were prepared by Mr. Paley, of Lancaster, and—why, we don't know, but he selected a style of architecture something of the Queen Anne period; a quaint style developed after the more pure and stately periods of Gothic architecture had declined. So you see the first introduction of the word `Anne' may be said to have come with the architecture of the church. But, there was another and more direct reason that introduced the word Saint and gave the name of St. Annes to that church. 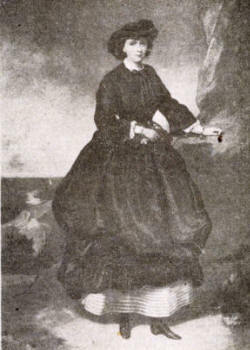 Lady Cecily Clifton had recently lost a near relative. Lady Ann Becket, and it was her wish that the church should be dedicated to St. Annes, in memory of her lamented and departed relative, hence we get the first portion of the name "St.Annes"
The new church, then a Chapel of Ease to Lytham Parish Church, cost £4,000 in its original form (see 1885 photograph). In addition to That sum the farmers of Heyhouses and district did all the carting of materials free of charge. 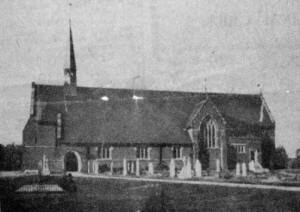 In August, 1873, the new church was dedicated and opened. In its original form there was seating accommodation for 350 worshippers. The Rev. Arthur Wellington Booker, M.A., was appointed curate-in-charge, a position he held for three years and eight months--till the end of April, 1877; afterwards receiving preferment to Wiltshire, where he died. Canon Hawkins, Vicar of Lytham, appointed the Rev. William Gregory Terry, M.A., as successor to Mr. Booker, and he entered upon his duties on May 6th, 1877. In that year (two years after the founding of the new town), St. Annes was created a parish, and Mr. Terry became the first Vicar of St. Annes. He died in September, 1899, after ministering to the parish for 22 years. Lady Cecily's gifts to St. Annes: Church during this period were on a, lavish scale. The church, without the tower, cost £4,000; the Vicarage, also Lady Cecily's gift, cost over £2,000; she contributed largely to the new Heyhouses School; she presented four stained-glass windows of a value of £2,000; the two-manual organ (£450): was her ladyship's gift; and in 1890, after the enlargement of the church and construction of the tower, she gave the peal of eight bells, at a cost of £700. In 1892 a cheque was received from Lady Cecily for £182, to clear the debt our the tower fund; and in 1894 she subscribed £100 towards the building of the Orchard Road Mission Room (until recently St. Mary's), as well as giving the chancel furniture. Her known gifts to St. A lutes Parish Church exceeded £10,000. The congregation of the Parish Church have long had a high reputation for generosity. Between 1885 and 1891 the sum of £7,000 was raised for church extensions, or from 1873 to 1891, £17,000, irrespective of Sunday offertories. During the 28 years' vicariate of the late Canon Butler a sum of £10,000 was raised by bazaars and special efforts, and since the induction of the Rev. A. Aspin on May 7th of last year (1928) (the Rev. W. G. Terry's induction was on May 6th, 1877), a sum of £3,000 has been raised towards The Debt Fund, if addition to the usual maintenance revenue. Thus St. Annes Parish Church, built, years ago to provide for the spiritual needs of it scattered rural population, has kept pace with the expansion of the town in service and in finance. It is confidently and sincerely hoped that the intention of the Vicar will be fulfilled during the present year by the complete removal of the debt. The courage and optimism of the Rev. A. Aspin deserves that consummation.